Applications for the Nephrology Fellowship Program are accepted only through the Electronic Residency Application Service (ERAS). Antonia Harford, MD, is the Nephrology Fellowship Program Director at the University of New Mexico School of Medicine. Yue-Harn Ng, MD and Darlene Vigil, MD, are the Nephrology Fellowship Associate Program Directors at the University of New Mexico School of Medicine. 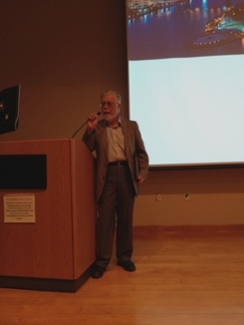 The goal of the Nephrology Fellowship Program at the University of New Mexico Health Sciences Center is to provide subspecialty training in nephrology to internists who will become board certified in nephrology and pursue productive careers in academic medicine, public health, clinical practice or industry. All trainees accepted into the program are expected to be eligible for and sit for nephrology boards after completion of training. The Nephrology Fellowship Program within UNM's Department of Internal Medicine is a two-year fellowship, with an optional third year, which emphasizes the development of experience and proficiency in clinical, investigative, and educational aspects of nephrology. The structure of the program will be flexible so that trainees may equip themselves for a career as either clinical or investigative nephrologists. In general, the first year emphasizes the acquisition of basic skills in clinical nephrology, including renal transplant and dialysis. During the first year, the fellow identifies a faculty research mentor and identifies a research project. The second year involves a continued role in patient care, with the balance of available time individualized to the pursuit of specific research interests, either clinical or basic science oriented. An optional third year can be offered in critical care. After couple completion of this 12 month rotation in critical care, the trainee is eligible to sit for critical care boards. During their training, our fellows will be exposed to all aspects of nephrology, including clinical nephrology, basic science, renal pathology, renal radiology, problem case management, journal clubs, and research conferences. Intensive Out-Patient Dialysis Experiences (peritoneal dialysis, technical aspects of hemodialysis including water and dialysis equipment, quality initiatives of federal regulations of dialysis unit practice. Research is an important aspect of nephrology training at UNM. With assistance from a nephrology faculty mentor, the fellows have dedicated research time in the second year to choose ongoing research projects of their own interest. We strongly encourage and support our fellows to submit and present their research at national meetings. 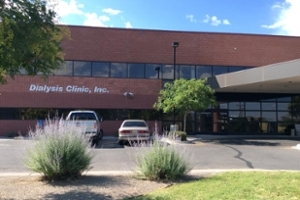 Training is conducted at University Hospital, the Veteran's Administration Medical Center, and local dialysis units of Dialysis Clinic, Inc.
University Hospital is on the University of New Mexico Health Sciences Center campus. It is a 368-bed general and tertiary care hospital including full pediatric services, outpatient facilities and the only level I trauma center in the state of New Mexico. The hospital also operates its own air service, including fixed-wing and helicopter. The New Mexico VA Health Care system (VAMC/Air Force hospital) is a 350-bed general and tertiary care hospital that serves veterans from a four state area, active duty Air Force personnel and their dependents. Although the majority of the patients are men, because of the mission to serve the active duty Air Force and their dependents, there is a Women's Health Center and a higher number of female patients than at the typical VA hospital. Dialysis Clinic, Inc.: DCI is the nation’s largest nonprofit dialysis provider that operates over 210 dialysis clinics in 27 states. Fellows will conduct their outpatient dialysis rounds at a DCI clinic conveniently located close to the University Hospital. Complete your application through the Electronic Residency Application Service (ERAS). All applications must come through this service. A complete application will include the common application form, medical school transcript, personal statement, USMLE/COMLEX scores, Dean’s letter, three to four letters of recommendation and a passport-size photograph. Once we have received the application through ERAS, we will send you an e-mail through ERAS to let you know whether or not you’ve been invited to interview with our program. Applications will be accepted only through ERAS. International Medical Graduates should apply through the ECFMG office; see instructions at http://www.ecfmg.org or contact the ECFMG directly for further information. Green Card, J-1 Visa or documentation of US Citizenship. 3 of 4 letters of recommendation from academic physicians you have worked with in the U.S.